A new reactor design could make nuclear power safer and cheaper, says John Gilleland. Wave of the future: Unlike today’s reactors, a traveling-wave reactor requires very little enriched uranium, reducing the risk of weapons proliferation. (Click here for a larger diagram, also on page 3). The reactor uses depleted-uranium fuel packed inside hundreds of hexagonal pillars (shown in black and green). In a “wave” that moves through the core at only a centimeter per year, this fuel is transformed (or bred) into plutonium, which then undergoes fission. The reaction requires a small amount of enriched uranium (not shown) to get started and could run for decades without refueling. The reactor uses liquid sodium as a coolant; core temperatures are extremely hot--about 550 ºC, versus the 330 ºC typical of conventional reactors. Wave of the future: Unlike today’s reactors, a traveling-wave reactor requires very little enriched uranium, reducing the risk of weapons proliferation. (Click here for a larger diagram, also on page 3). The reactor uses depleted-uranium fuel packed inside hundreds of hexagonal pillars (shown in black and green). In a “wave” that moves through the core at only a centimeter per year, this fuel is transformed (or bred) into plutonium, which then undergoes fission. The reaction requires a small amount of enriched uranium (not shown) to get started and could run for decades without refueling. 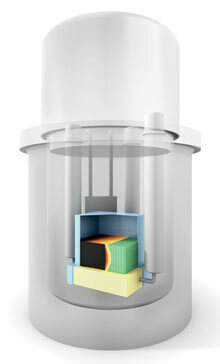 The reactor uses liquid sodium as a coolant; core temperatures are extremely hot–about 550 ºC, versus the 330 ºC typical of conventional reactors. Enriching the uranium for reactor fuel and opening the reactor periodically to refuel it are among the most cumbersome and expensive steps in running a nuclear plant. And after spent fuel is removed from the reactor, reprocessing it to recover usable materials has the same drawbacks, plus two more: the risks of nuclear-weapons proliferation and environmental pollution. These problems are mostly accepted as a given, but not by a group of researcher­s at Intellectual Ventures, an invention and investment company in Bellevue, WA. The scientists there have come up with a preliminary design for a reactor that requires only a small amount of enriched fuel–that is, the kind whose atoms can easily be split in a chain reaction. It’s called a traveling­-wave reactor. And while government researchers intermittently bring out new reactor designs, the traveling-wave reactor is noteworthy for having come from something that barely exists in the nuclear industry: a privately funded research company. As it runs, the core in a traveling-­wave reactor gradually converts nonfissile material into the fuel it needs. Nuclear reactors based on such designs “theoretically could run for a couple of hundred years” without refueling, says John G­illeland, manager of nuclear programs at Intellectual Ventures. Gilleland’s aim is to run a nuclear reactor on what is now waste. ­Conventional reactors use uranium-235, which splits easily to carry on a chain reaction but is scarce and expensive; it must be separated from the more common, nonfissile uranium-238 in special enrichment plants. Every 18 to 24 months, the reactor must be opened, hundreds of fuel bundles removed, hundreds added, and the remainder reshuffled to supply all the fissile uranium needed for the next run. This raises proliferation concerns, since an enrichment plant designed to make low-enriched uranium for a power reactor differs trivially from one that makes highly enriched material for a bomb.